How to draw Manga man face 3 different ways. 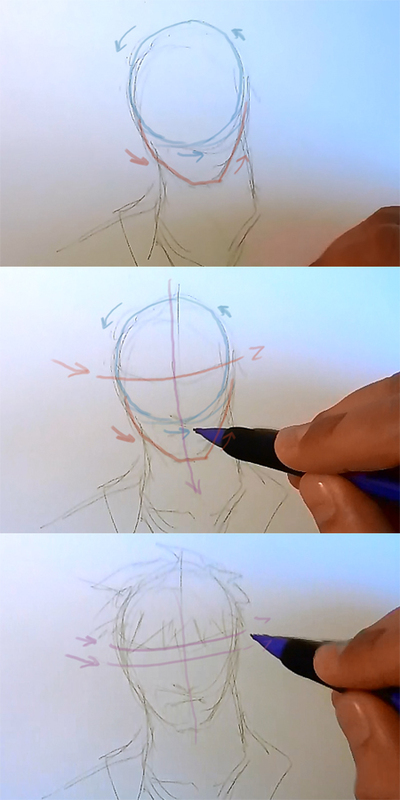 This video tutorial I will show you how to draw 3 different Anime face of guys. Here is a drawing tutorial for Manga guys faces. You can scroll down further to see step by step tutorial. I am going to explain how I drew it step by step. This one easy to follow with simple video drawing and step by step images along with. This should be quick, easy to follow Manga tutorial. 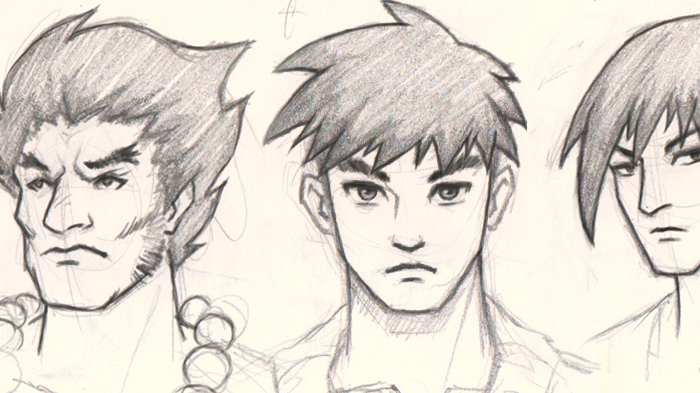 Here is a finish Manga faces drawing, 3 guy faces. 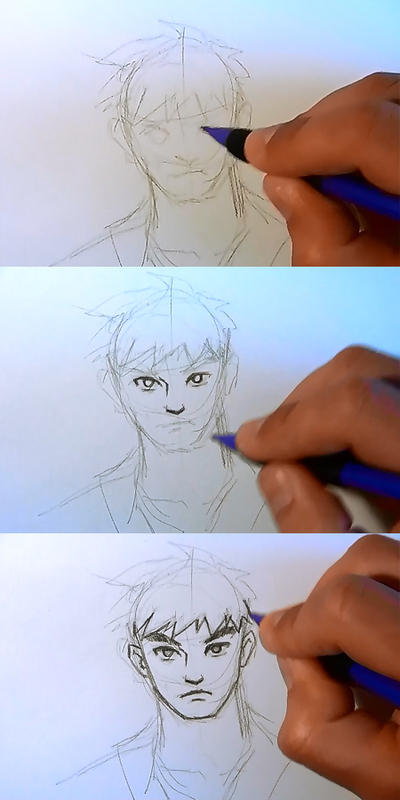 Below are step by step images of how to draw Manga face 1, simple and typical Manga hero guy. 1) I start with an circle shape drawing (but imagine it’s a sphere) then add the additional line below that makes it an oval. On this one I am going to draw a front view. face shot. 2) I drew a horizontal line across the face. The line should split the 1st circle shape in half. Then I drew a vertical line to split the face in half. 3) I then draw another horizontal line below the previous horizontal line. The gap between the two lines should equal the estimate eyes’ height. Then the tip of the nose should be middle way between the upper horizontal line and the chin. Finally, I add the spiky short hair style. 4) Then I draw the eyes, it should no be taller than the distance of the top and bottom horizontal lines that I added on to the first horizontal. Also the distance between the two eyes should equal one eye. Now you have an overall rough sketch of the face and head. 5) After that, I then I draw over the initial eyes and nose sketch. 6) At this stage, I have all the important facial feature mark. Then I begin to draw over the rough sketch and refine the line drawn. 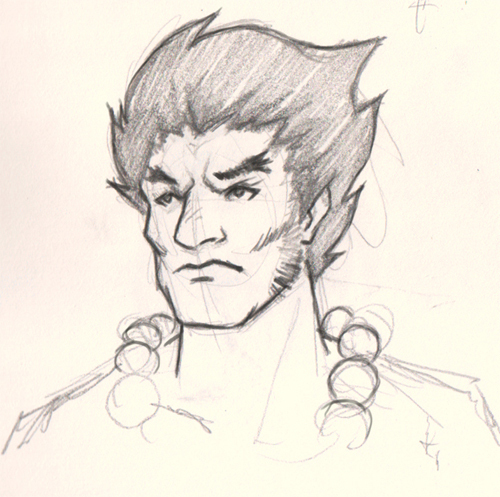 Here is a final manga man face one. 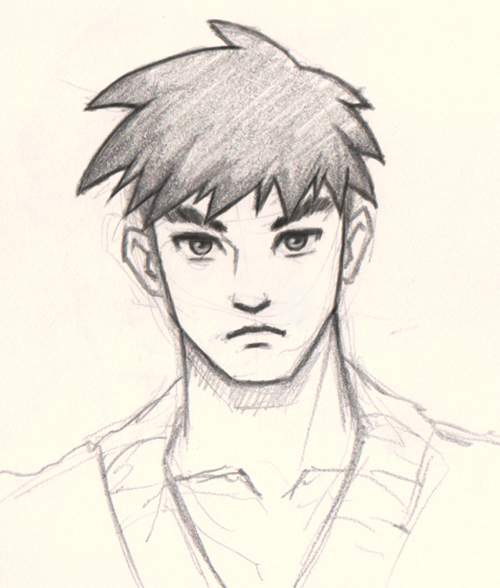 Here is a final drawing of a strong guy Manga face or face number three.